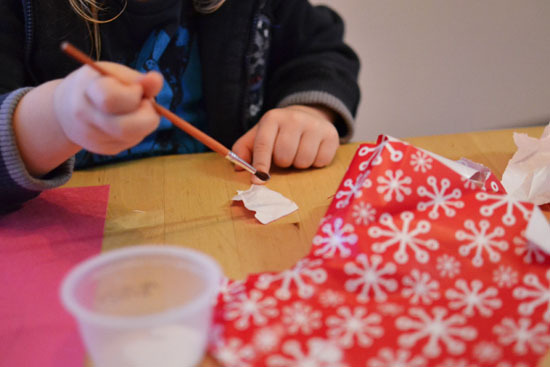 Are you looking for a quick, simple, low mess Christmas craft? 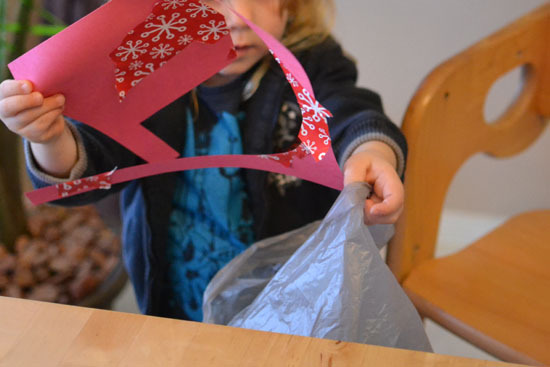 E made a lovely Candy Cane Wrapping Paper Collage that had her practicing her scissor, gluing, problem solving and fine motor skills while recycling some used wrapping paper – and we ended up putting the finished product on our Christmas tree as an ornament. Small bowl for the glue. 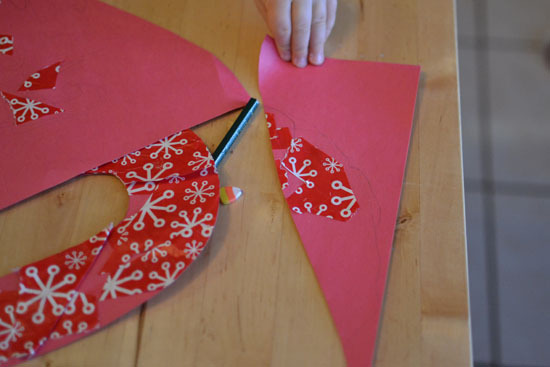 I drew a large candy cane shape on a red sheet of construction paper to get us started. 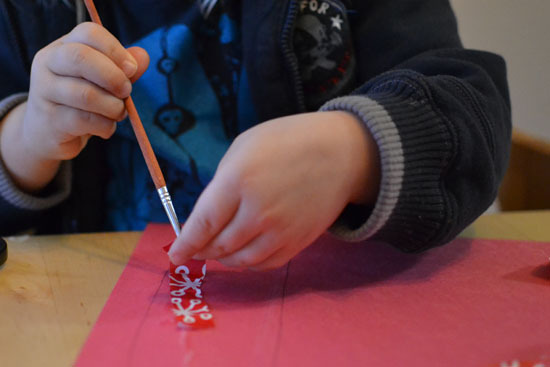 E got started cutting the red and white wrapping paper into smaller pieces right away. 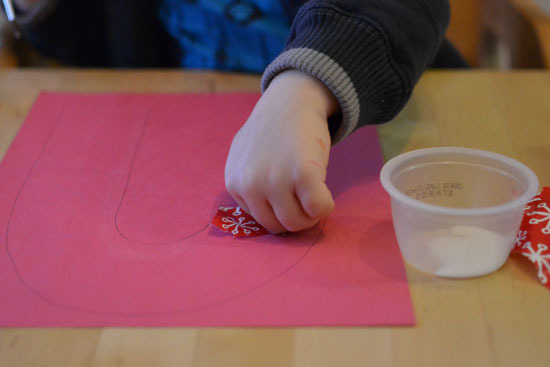 I’d provided a small empty bowl in case she wanted to cut several pieces before gluing them on but she preferred to glue each piece as she finished cutting it. Some pieces E cut ended up quite small, and she had to figure out how to get them off her fingers and on the paper. 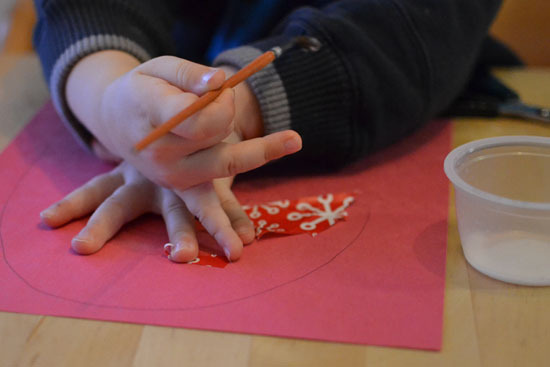 Other pieces didn’t stick to the paper properly, and E found out how to add more glue to the areas that needed it. 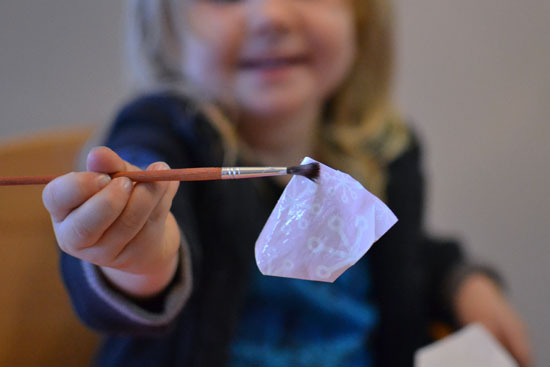 She thought it was hilarious when the paper stuck to her paintbrush and made sure to show it to me. 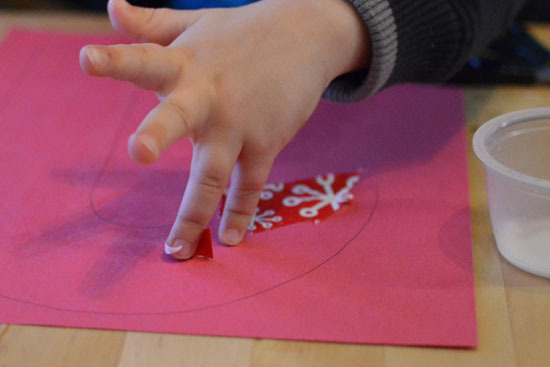 and also experimented with applying glue to the construction paper before sticking the wrapping paper on top. When she was done, you could still see the basic shape of the candy cane – she’d definitely been trying to stay between the lines. 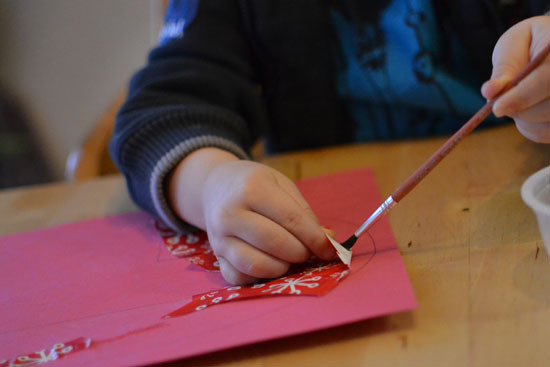 While we let the wrapping paper collage dry a bit, E decided to draw a candy cane for me to cover with wrapping paper 🙂 And of course she used the same eraser I had used earlier! 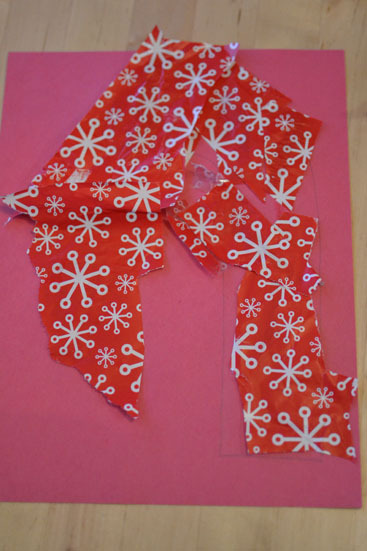 I cut the pieces of wrapping paper and put glue on them, then put them on the paper according to E’s instructions. By the time she’d had enough, her original candy cane collage had dried enough for me to cut it out for her. 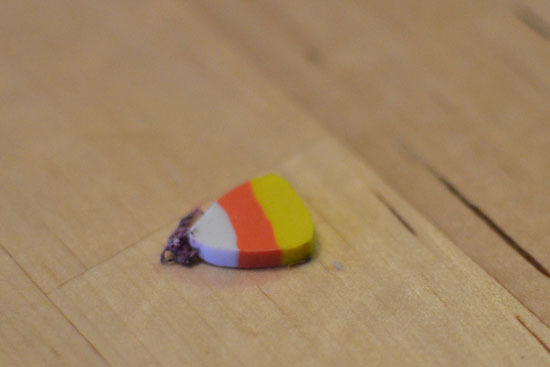 That meant that she had to cut the sheet with my “candy cane”, as well – and she was very amused when she noticed she’d cut a “pizza”. We both had to taste it, of course! 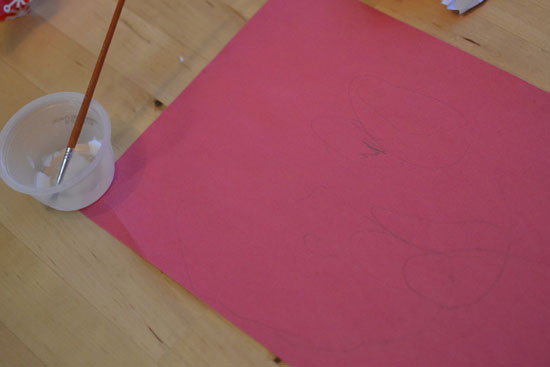 The clean up was really short – the biggest “mess” was a spot of glue on the table but I wiped it off easily. For even less mess, use a glue stick instead of white glue. 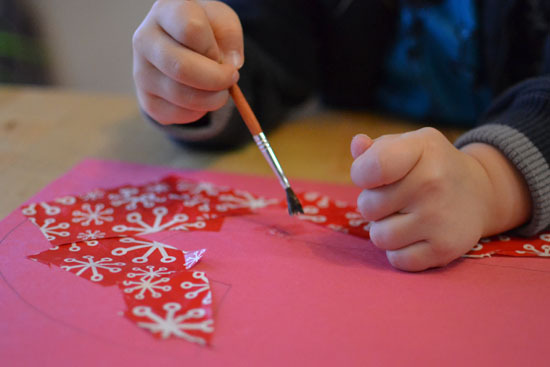 You can use any kind of paper for the collage, construction paper, tissue paper, even colorful pages from a magazine, whatever you have on hand. 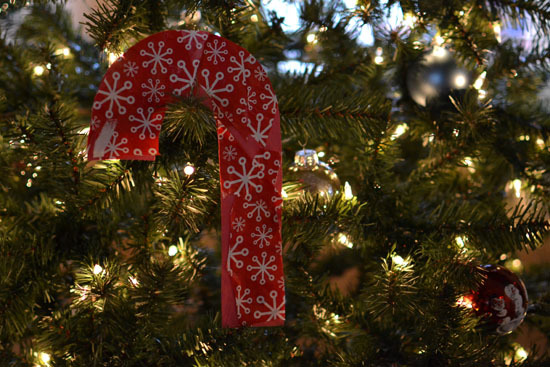 If your child is up for it, she can make a pattern with solid colored red and white paper to make it look even more like a candy cane. 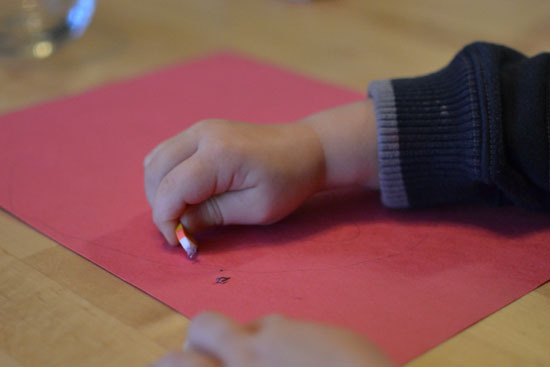 Older kids can draw their own outline, or skip the outline altogether. 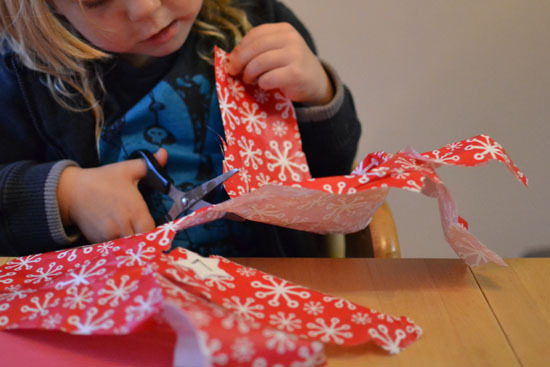 Have you made a wrapping paper collage? 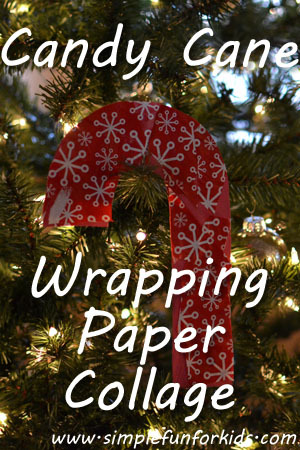 How do you recycle your wrapping paper? Leave a comment and tell me all about it!